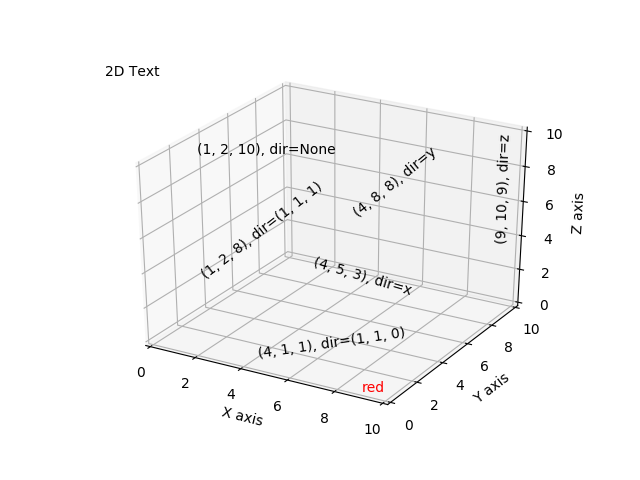 Demonstrates the placement of text annotations on a 3D plot. Using the text function with three types of ‘zdir’ values: None, an axis name (ex. ‘x’), or a direction tuple (ex. (1, 1, 0)). Using the text function with the color keyword. Using the text2D function to place text on a fixed position on the ax object. # Placement 0, 0 would be the bottom left, 1, 1 would be the top right. © Copyright 2002 - 2012 John Hunter, Darren Dale, Eric Firing, Michael Droettboom and the Matplotlib development team; 2012 - 2017 The Matplotlib development team. Last updated on Oct 13, 2017. Created using Sphinx 1.6.3.